Upon returning to Springfield for special session on Wednesday, House Minority Leader Jim Durkin (R-Western Springs), Senate Deputy Republican Leader Bill Brady (R-Bloomington), Assistant Senate Republican Leader Jason Barickman (R-Bloomington), Senate Republican Caucus Whip Karen McConnaughay (R-St. Charles), Senator Dale Righter (R-Mattoon), Deputy House Republican Leader Patti Bellock (R-Hinsdale), Deputy House Republican Leader Dan Brady (R-Normal) and House Republican Conference Chairperson Tom Demmer (R-Dixon) offered a reminder that a compromise balanced budget with reforms is on the table and ready to be enacted. –Budget Bills (SB 2176, 2214, 2215, 2216, 2217, 2218): Comprehensive budget proposal that includes real spending cuts and a four-year spending cap, while providing funding to state agencies like the Department of Human Services to care for our state’s most vulnerable and the Department of Transportation to continue important infrastructure projects. –Property Tax Relief (HB 4066) Four-year freeze for all taxing districts, but would allow residents, through voter referendum, to lower or increase their taxes. Allows for an exemption on existing debt service payments as requested by Senate Democrats. –Local Government Consolidation (HB 4067): Strengthens and improves the already passed SB 3, and will allow for citizens-initiated consolidation on units of local government. –Education Funding (SB 1124, HB 4069): Changes to the K-12 education funding formula that treats every district equitably that is consistent with the bipartisan framework of the Governor’s School Funding Commission. Funding for early childhood education, K-12 education, community colleges and universities. –Workers’ Comp (HB 4068): Uses previously negotiated language between Senate GOP and Senate Democrats, like changes to the medical fee schedule, but does not reduce benefits to workers or include a causation standard. 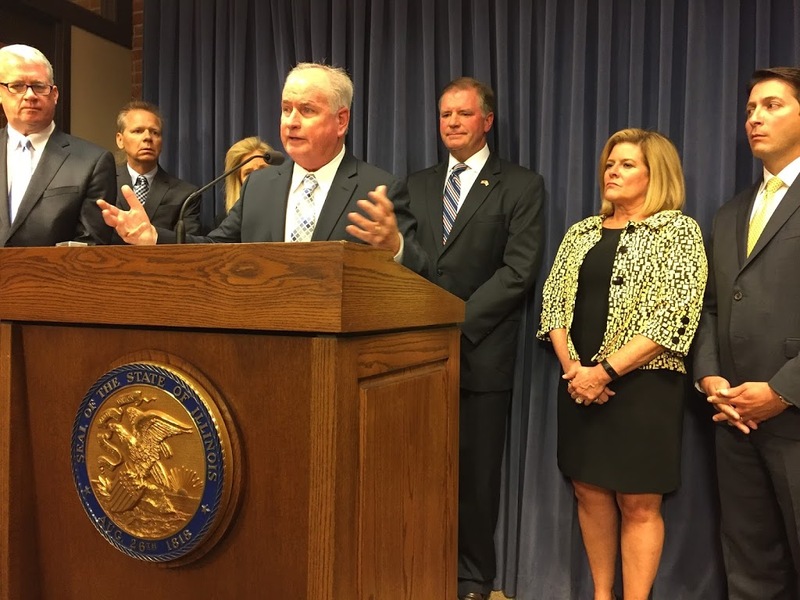 –Pension Reform (HB 4064): Accepts SB 16, which has previously passed the Senate, including President Cullerton’s consideration model and the state’s pickup of Chicago Public School’s pension payments. –Term Limits (HJRCA 33, HJRCA 2) : Constitutional amendment to impose 10-year term limits on legislative leaders in the General Assembly and eight-year limit on Constitutional Officers (Governor, Lt. Governor, Attorney General, Comptroller, Treasurer, and Secretary of State).